Jennifer Joanna Aniston is an American actress, film director, and producer. She gained worldwide recognition in the 1990s for portraying Rachel Green in the television sitcom Friends, a role which earned her an Emmy Award, a Golden Globe Award, and a Screen Actors Guild Award. Aniston has also enjoyed a successful film career, having appeared in several Hollywood productions. She gained critical acclaim for her performances in the independent films She’s the One (1996), Office Space (1999), The Good Girl (2002) and Friends with Money (2006). She has had her greatest commercial successes with the films Bruce Almighty (2003), The Break-Up (2006), Marley & Me (2008), and Just Go with It (2011). I figured while we were on the topic of Jennifer Aniston I should post these horrendous photos of her from the February 2011 edition of Allure Magazine. It’s not that Jen looks that bad, well I take that back, YES she does, it’s that she has been airbrushed into a lifeless babydoll zombie…not her best look! I’m really not sure what they were going for here, but I’m pretty sure they missed the mark. That is unless they have a secret vendetta against Miss Aniston, in which case they succeeded in sucking all the beauty out of her. What do you think of the Allure photo spread? Does it work for Jen? 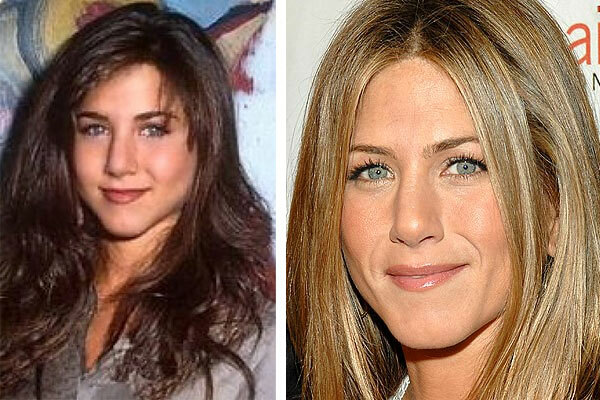 None of us are getting any younger these days, including Jennifer Aniston, so how does she keep up her youthful appearance? Well, according to Jen she says she has never visited the plastic surgeons office, but she’s not opposed to it in the future. Perhaps when she is around 50, she has implied in interviews. But what of that altered nose, apparently she must have ‘conveniently’ forgot to mention that little tweak. 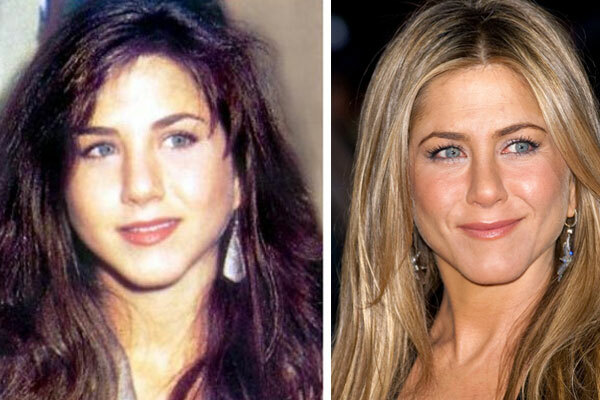 It is obvious that Jennifer had a rhinoplasty procedure early on in her career to refine the bridge of her nose a bit. It was done very well and still kept true to her original nose’s shape. Jennifer has also dabbled in botox, not liking the outcome she said, “I make my living from my expressions, so it’s not a great thing to do.” We have trouble believing that though because at Jen’s age she is obviously looking rather smooth and wrinkle free for a 42 year old woman. The next tweak she has made for her upgraded face would be a little bit of lip injections to fill out her top lip. It doesn’t look bad, and is hardly even noticeable unless you look at the before pics. What do you think of Jennifer Aniston’s face, nicely done?